I have been getting questions like these for the past... seven or so episodes. So today I’m going to reel it in and start at the beginning with the book art basics. We have guests Ariel Hansen Strong and Faith Hale here today to play Book Art Trivia, and we have compiled the top 5 frequently asked questions which we will try to answer, and I got a new kazoo so you know we’re all in for a big treat. Book Arts Web - great resource for all things book art! 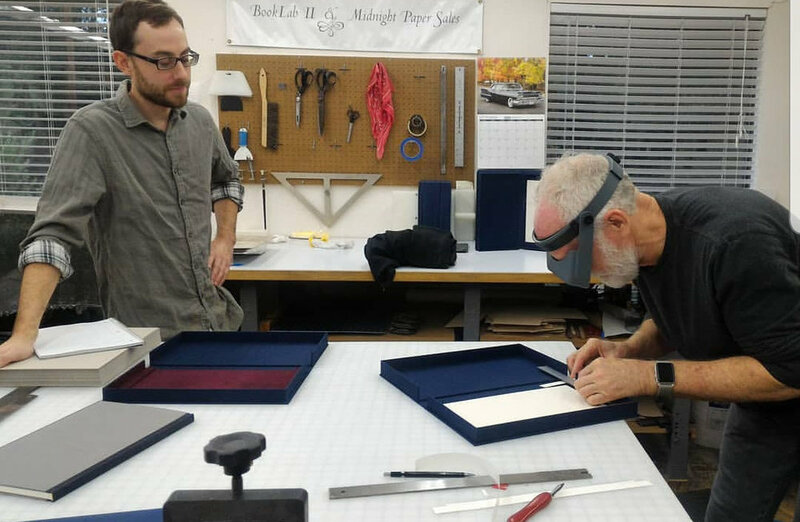 A few months ago, I had the pleasure of speaking with book artist Lyall Harris. Unfortunately, due to some technical difficulties, I was unable to release the episode before the opening of Lyall and Patricia Silva’s exhibition at the San Francisco Public Library in June. It took some time and YouTube tutorials, but I managed to clean up the audio to make it somewhat listenable, and I do believe that the content in the conversation truly outweighs my shortcomings with recording. The other good news is that Lyall and Patricia’s exhibition is still going on view and there will be a panel discussion on creative collaboration on September 9, 2017. Lyall Harris is a book artist, writer and painter who lives and works in Charlottesville, VA, and Florence, Italy. Lyall's artwork has been exhibited in more than one hundred solo and juried group shows and recognized with over twenty awards. She has been the recipient of fellowships at Virginia Center for the Creative Arts, NALL Foundation in Vence, France, and San Francisco's Grabhorn Institute. Lyall is also the co-founder and co-editor of The Sigh Press literary and art journal in Florence, Italy. Meeting Places/Luoghi d’incontro is the collaborative work by Lyall and Florence, Italy-based book artist and printmaker Patricia Silva. After having met in Florence, Lyall Harris and Patricia Silva embarked on a series of twelve collaborative book art projects since 2014.The artists set constraints for the process, both of materials and time, which forced them to work in an immediate, intuitive and exploratory way. The varied work addresses issues and histories from their shared and layered perspectives as artists, mothers, daughters, wives, and expats in a changing and complex environment. Meeting Places is now on view at the San Francisco Public Library through September 14, 2017. Meeting Places/Luoghi d’incontro collaborative work by Lyall Harris and Patricia Silva is on view at the San Francisco Public Library through September 14, 2017. Today we are on the hunt for missing punctuation. Like many letters and even entire words, quite a few good punctuation marks have been lost to modern English. In this episode, we’re going to track down some forgotten and elusive marks, from the mysterious Pilcrow to the playful interrobang. Today I have a very exciting noir-themed audio drama filled with questionable acting and an unforgivable amount of punctuation puns. For his 90th birthday in February 1913, renowned British naturalist and evolutionary biologist Alfred Russel Wallace received a mysterious package containing a small booklet called Shall We Have Common Sense. This booklet, dated 1849, contained essays on evolution through natural selection and germ theory. If this booklet is authentic, it precedes Darwin and Wallace’s publications on evolution by a decade, and Louis Pasteur’s writings on germ theory by nearly two decades. Is it a genuine remarkable discovery? Is it an elaborate and confusing hoax? Join in on the investigation as we explore some intriguing characters like the eccentric atheist George Washington Sleeper, British naturalists Alfred Russel Wallace and Edward B. Poulton, and a mysterious little booklet that could change the history of evolutionary theory. If you have additional information you'd like to share about the typeface for this booklet, George Sleeper, or The Linnean Society, please contact me! A commonplace book is a compilation of information or inspiration - anything that one would like to remember or save to reference later. They differ from diaries or journals, in that it usually organized by topic instead of date, and culls information from many sources instead of being autobiographical. For this episode, I wanted to create a "commonplace audiobook" about creative block. I have compiled some information about the creative process in general, a few famous examples of creative blocks, advice on rekindling inspiration, music and audio clips that might help to encourage some artistic inspiration. Today's episode is all about reading - what it means to read, how we read, and a brief history of reading. I'll talk about literacy rates, the alphabetic principle, phonetics, and nonsense poems by Lewis Carroll. I am also very excited to announce that Books in the Wild has been awarded a Project Grant by the College Book Art Association ensuring that this podcast stays alive through 2017! Originally published as Marginalia Podcast in November of 2016, this is our sample/pilot episode for Books in the Wild. In this episode we cover the gruesome book of John Horwood, a man whose punishment for his crimes didn't stop at just execution. We also go into the tall tales of Harry Oliver, self-proclaimed Writer, Editor, Publisher, Distributor, Artist, Owner, Mirage Salesman, Secessionist, and Press Agent for The Desert Rat Scrap Book, a single broadsheet newspaper printed quarterly from 1945 to 1967.